One of our favorite foods beginning with the letter N is noodles. A bowl of chicken and noodles is one of those comfort foods that I make several times a year for our family--including at Thanksgiving and Christmas. I generally use chicken broth leftover from roasting or boiling chicken for my noodles--but, recently discovered Knorr Homestyle Chicken Stock and it works well when I don't have enough quality broth on hand for the dish or when I want to use left over rotisserie style chicken instead of home cooked chicken. 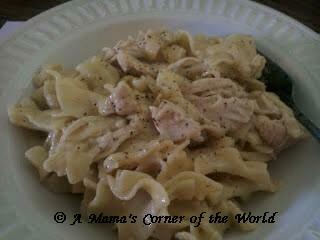 We are using our Homemade Chicken and Noodles recipe for our N entry in the Blogging from A to Z challenge. Instructions for Homemade Chicken and Noodles. Prepare the Chicken Broth. Dissolve 1 tub of the Knorr Homestyle Chicken Stock by placing it into 6 cups of hot water in a large pot which will be used to boil the noodles. When nearly dissolved, add the vegetable broth and bring the mixture to a rolling boil over medium heat. Cook the noodles. Add the noodles to the boiling broth and cook according to package instructions. Set noodles aside and reserve broth. Remove the noodles from the broth with a slotted spoon to a bowl that can be set aside while you prepare the creamy sauce. Reserve 2 1/2 c. of the cooking liquid for use in the sauce. Prepare the cream sauce. Melt butter in a large, nonstick saucepan. Add flour and black pepper. Cook for 1-2 minutes, or until flour is slightly browned. Add two cups of reserved cooking broth. Stir and cook over medium heat until mixture thickens. Add 1 c. milk and the remaining 1/2 c. broth. Continue to cook and stir the sauce until the mixture is slightly thickened and bubbly. Whisk in the poultry seasoning. Remove sauce from heat. Combine the noodles, chicken and sauce. Gently stir the sauce into the noodles until noodles are moistened and covered with sauce. Mix in the chicken and top with a sprinkle of ground black pepper. Serve warm. Disclaimer: I received a free sample of Knorr Homestyle Chicken Stock from Knorr and Smiley360 to try in my kitchen. I was not paid for this post and my decision to recommend this product for use in this recipe was not influenced by the brand. I do love homemade chicken and noodles. Great winter dish!